Borobudur, or Barabudur (Indonesian: Candi Borobudur, Javanese: ꦕꦤ꧀ꦣꦶꦧꦫꦧꦸꦣꦸꦂ, translit. Candhi Barabudhur) is a 9th-century Mahayana Buddhist temple in Magelang, Central Java, Indonesia, and the world's largest Buddhist temple. The temple consists of nine stacked platforms, six square and three circular, topped by a central dome. It is decorated with 2,672 relief panels and 504 Buddha statues. The central dome is surrounded by 72 Buddha statues, each seated inside a perforated stupa. Built in the 9th century during the reign of the Sailendra Dynasty, the temple design follows Javanese Buddhist architecture, which blends the Indonesian indigenous cult of ancestor worship and the Buddhist concept of attaining Nirvana. The temple demonstrates the influences of Gupta art that reflects India's influence on the region, yet there are enough indigenous scenes and elements incorporated to make Borobudur uniquely Indonesian. The monument is a shrine to the Lord Buddha and a place for Buddhist pilgrimage. The pilgrim journey begins at the base of the monument and follows a path around the monument, ascending to the top through three levels symbolic of Buddhist cosmology: Kāmadhātu (the world of desire), Rupadhatu (the world of forms) and Arupadhatu (the world of formlessness). The monument guides pilgrims through an extensive system of stairways and corridors with 1,460 narrative relief panels on the walls and the balustrades. 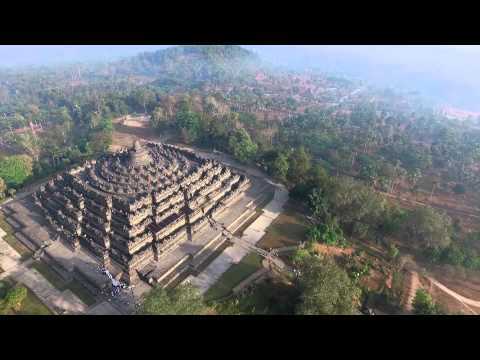 Borobudur has the largest and most complete ensemble of Buddhist reliefs in the world.